1-1/2" CTS CPVC Male Adapter | U.S. Plastic Corp.
Certified safe alternative to metal plumbing systems. 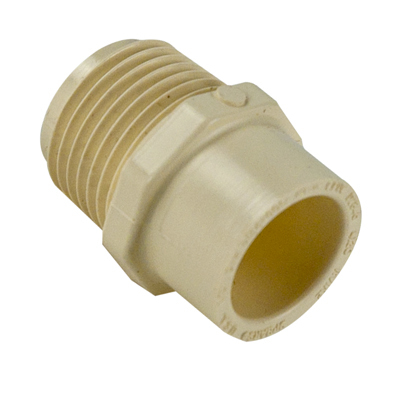 CPVC pipe and fittings have exceptional corrosion resistance. Unlike metal systems, CPVC products never rust, scale, or pit, and will provide many years of maintenance-free service and extended system life. Low heat conductivity minimizes heat loss in hot water systems. Smooth interior walls result in lower pressure loss and higher volume than conventional metal systems. Lower material costs than metallic systems, combined with lighter weight and ease of installation, can substantially reduce overall system cost. Male Adapters for cold water service only. Maximum temperature 180°F. Certified lead-free by NSF®. CTS CPVC products are ideally suited for hot and cold water distribution systems in residential and commercial structures, as well as recreational vehicles, modular homes and mobile homes.